Basketball is a game that incorporates athletic ability and academics. In order to be successful as a team, we will rely on a fundamental style of basketball. Each student/athlete will be asked to work hard because, “work comes before success.” Hard work will overcome all adversity. It is through this environment that the student/athlete will learn what it takes to be successful in athletics, as well as in life. 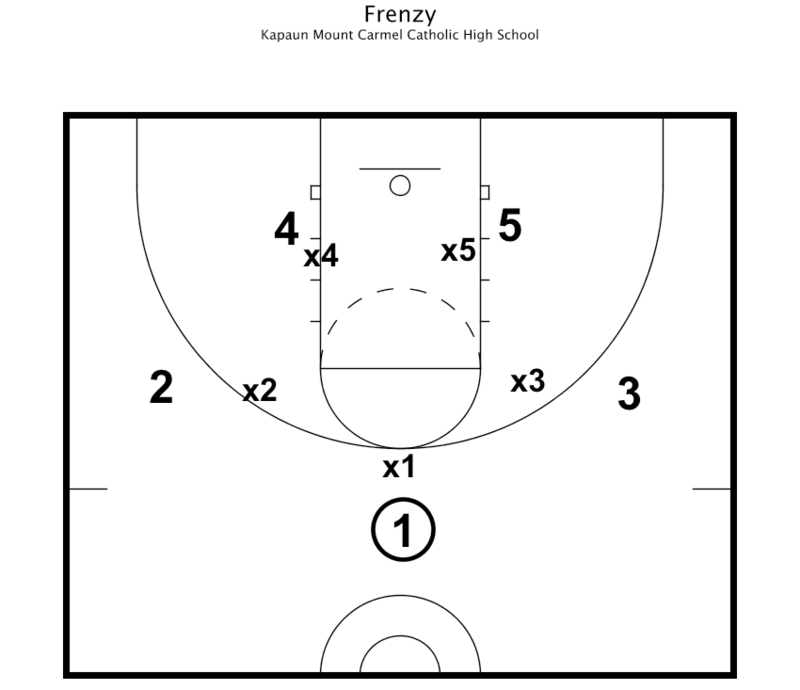 This practice plan drill teaches transition defense and spacing, playing the ball and help side defense. Players line up on the baseline and perform a 3 man weave to the cones 3/4ths the length of the court (passing, offensive spacing, and communication are key). Two defenders pick up the weave on the way back at half court defending the basket. Diagram 1: 1, 2, 3 do a 3 man weave down to other baseline and back, while two defenders run around cones then get to HIGH/LOW HOLE position. Only allowed two passes. Closing out the shooter begins with footwork and intensity. 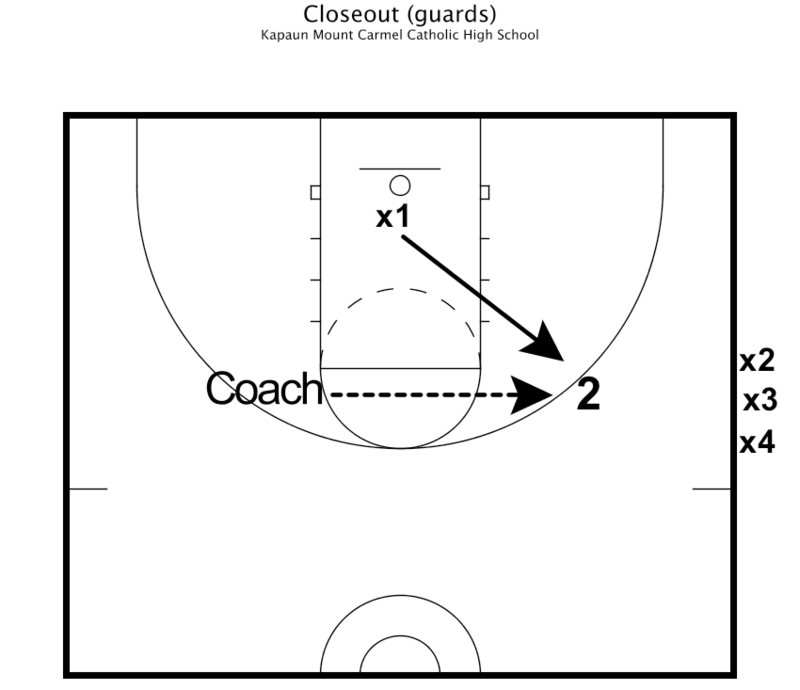 Coach stands on side opposite the offensive player and the defender begins in help side defensive position. Once the ball is passed to the offensive player, the defender sprints out to the ball with choppy feet, one hand in the passing lane, and the other hand on the ball in order to disrupt a shot or pass. Diagram 2: Coach passes to wing. 1 closeout with choppy feet as ball arrives. Getting into offensive player. Throw hands back and swing forward above head and then onto offensive player and into passing lane. 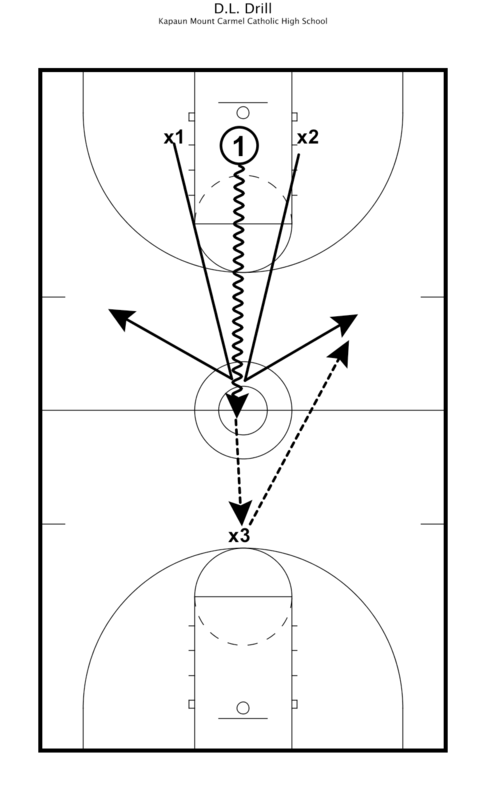 Diagram 3: Offensive player has two dribbles to blow by defender, first move and make back-up. Keep playing missed shot. Block out! D.L. 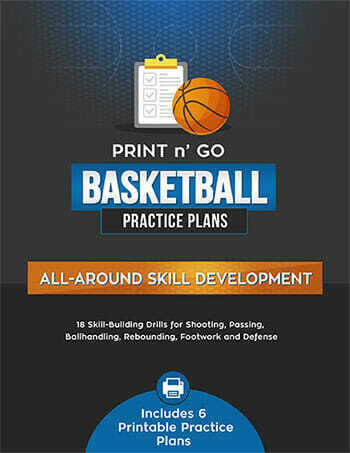 is named after a former assistant and teaches the back tip concept in a full court setting. Always teach athletes to use their inside hand and run through the ball in order to back tip. 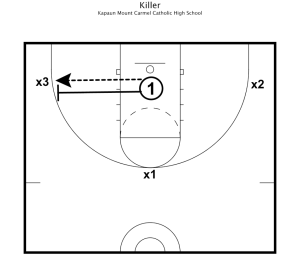 Effort is key in this drill and is a great conditioning defensive drill. Diagram 5: Back tip and pitch ahead. 4o0 drill which requires communication and players to sprint into position for defensive helpside. Players typically have difficulty stopping the ball and the closest man picks up the ball and drives the ball to the sideline. Diagram 6: Offensive player who gets ball has to get out defensively. 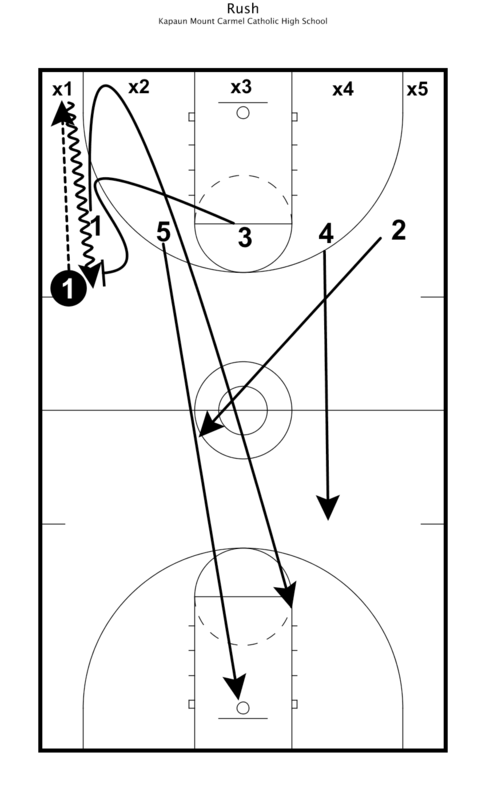 Everyone else JAMS dribbler, get middle back, covers LOW HOLE, and gets to interceptor position. Offense has 12 seconds to score. 3 stops gets win. 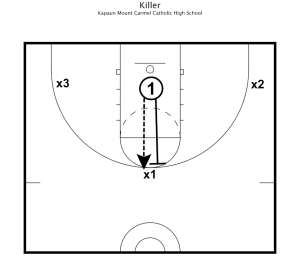 Shell drill where points are only scored on defensive stops. Offense shoots to get onto the defensive side of the ball. 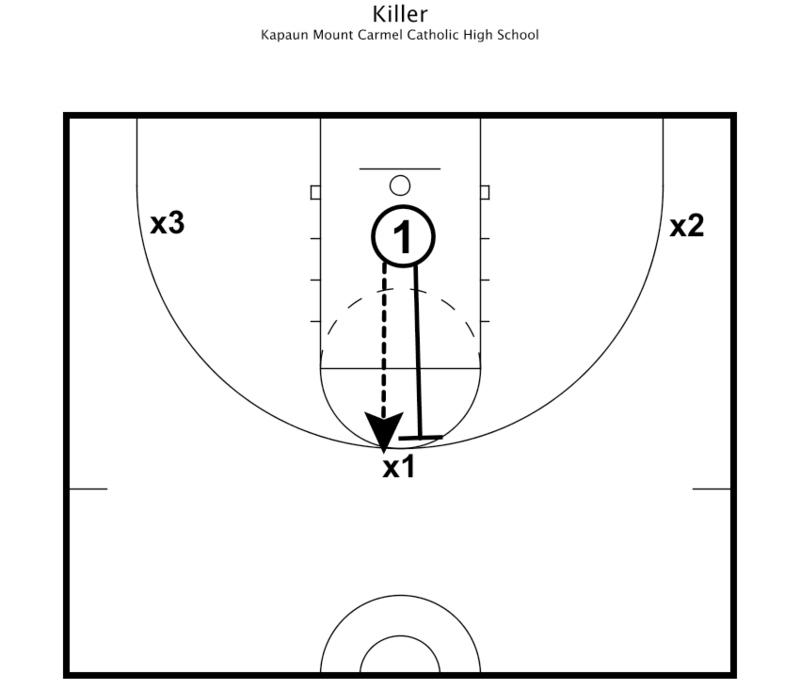 This drill works best with three or four groups competing for 7-8 minutes at a time. Everyone has to closeout, move while ball is in the air, and rebound. 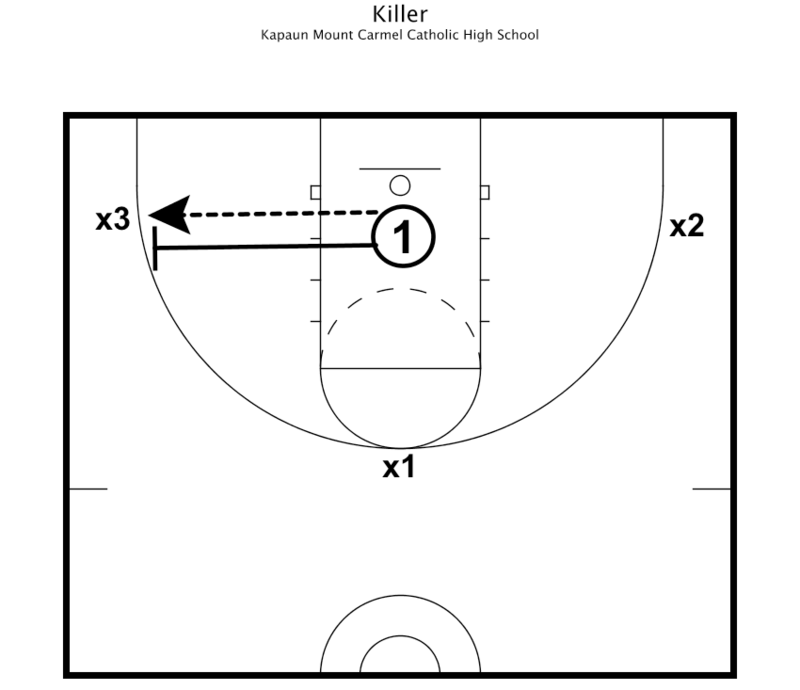 All around drill for several aspects of the game. Diagram 7: Score gets you on defense, 4 points (stop equals a point) ends game. Switch if you score, if get stop you stay on defense. 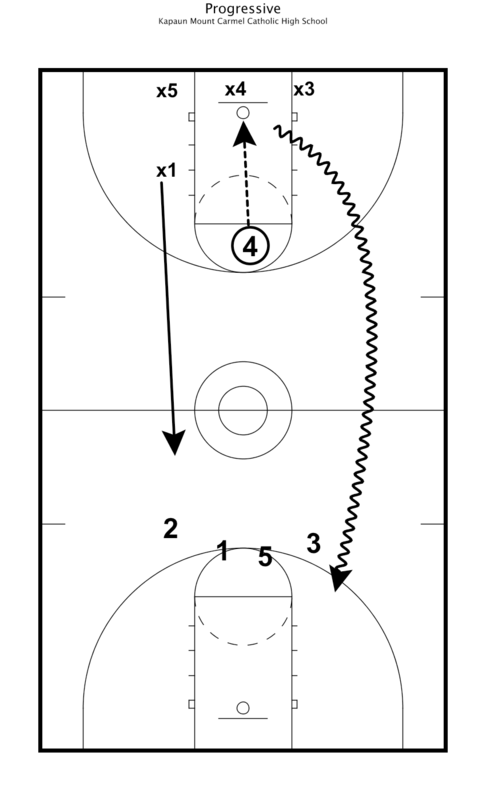 Time is set from 25-35 seconds and the ball always begins under the basket. The defender passes the ball to any of the three players and closes out and defends 1-2 dribbles. If offensive player scores, the defender must go right back at the scorer until they get a stop. 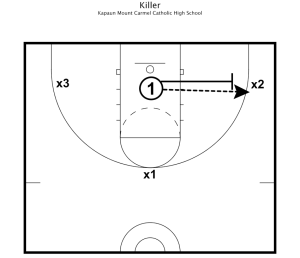 Teaches close out technique and toughness. Kids typically have fun trying to stop all three in the time allotted. 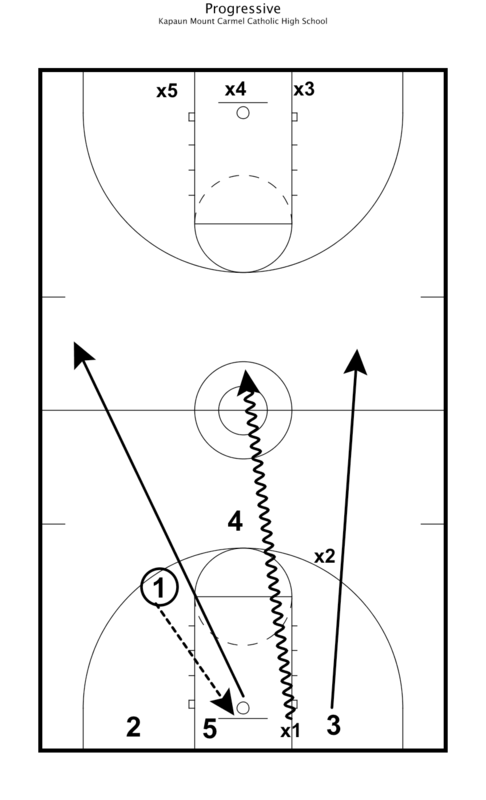 Diagram 8: 35 seconds: Defend each offensive player. No more than 2 dribbles. 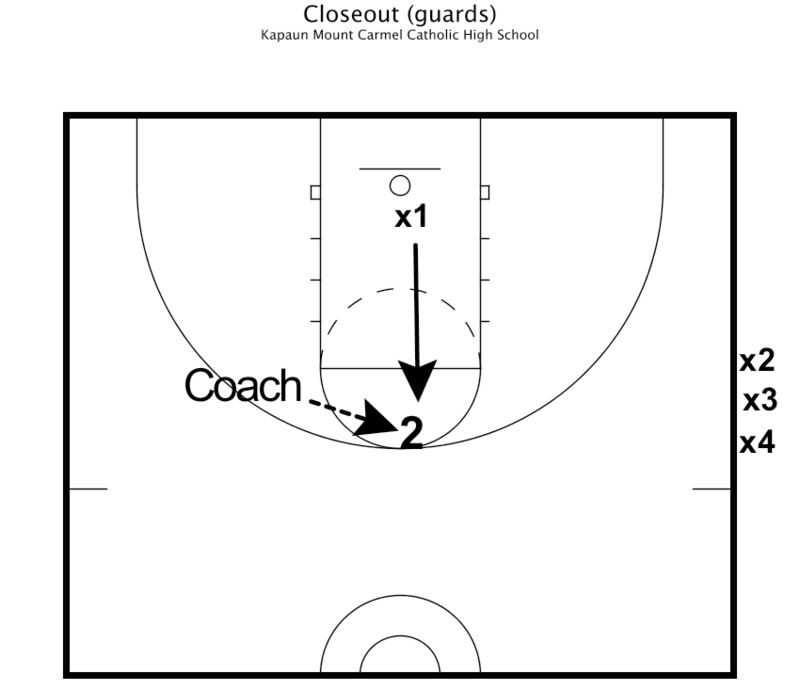 Roll ball to offensive player, then closeout and take away shots or scoring opportunities. On missed shot, block out offense can get ball and score again. Must get 3 stops in order to get out in 35 seconds. 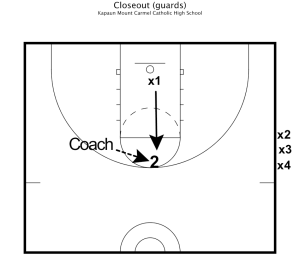 Diagram 11: Coach calls out number, and that number has to get out while is teammates try to rebound. Once defense gets rebound, then they go to othe rend while new defense is without “MAN DOWN” 4o5. 2 stops gets you out. 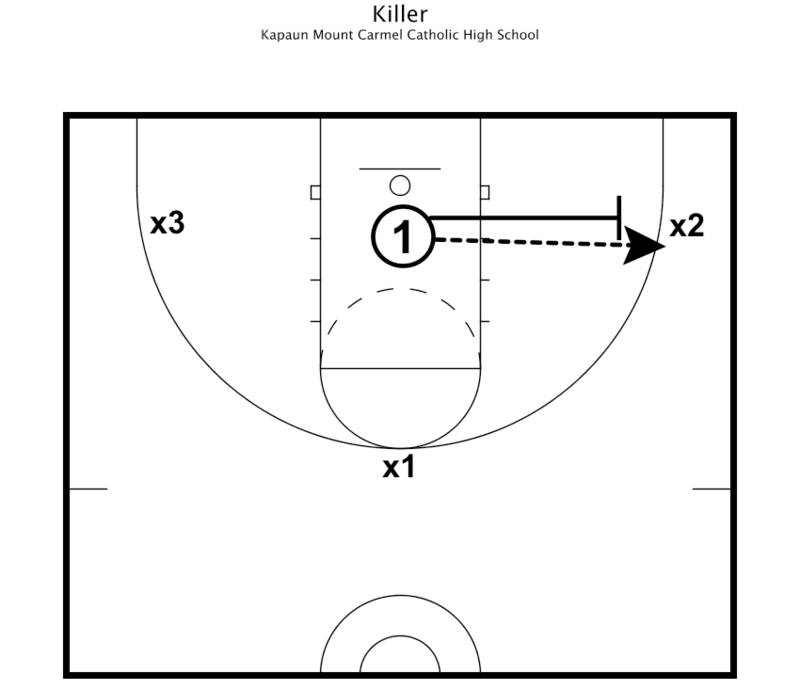 Zig-Zag drill which teaches toughness and multiple dribblers. 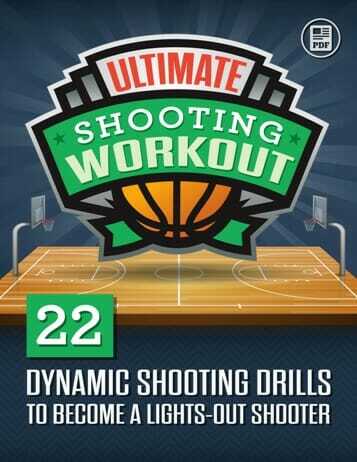 Great conditioning and ball handling drill. Time is placed at 6-8 minutes and athletes are required to defend 3-4 dribblers back to back until all have been defenders. A little twist on this drill is having the defenders hold a basketball and push on the dribbler in the defensive stance trying to knock the dribbler off balance. The ball must stay in contact with the dribbler at all times or that one dribbler gets reset to the beginning and the defender has to start over with that dribbler. 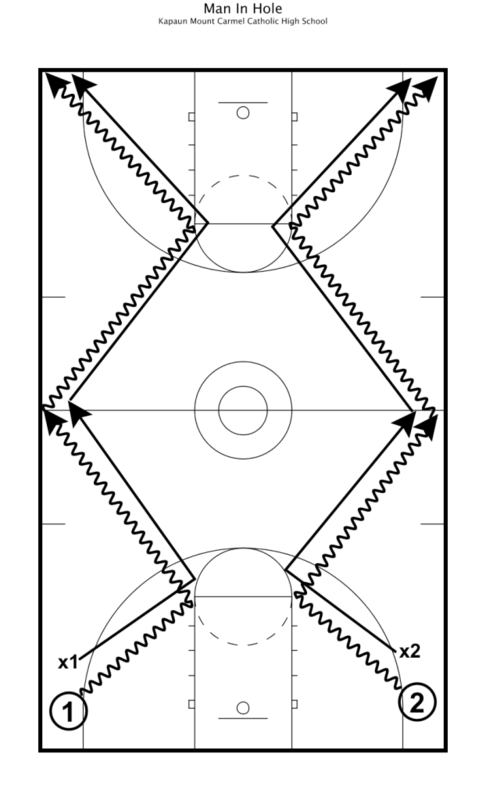 Diagram 12: Zig-Zag dribble drill: once defending, defensive player defends every player once. Get to one end go again immediately. 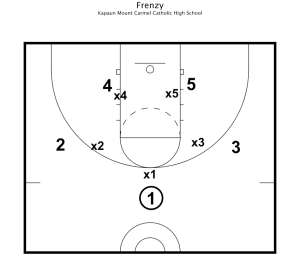 Begin this drill keeping score each possession in a 1o2 scenario. 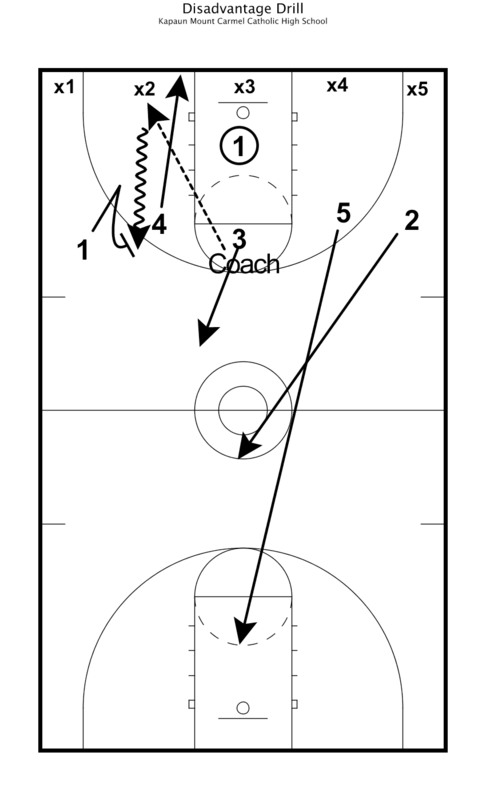 Then 2 players enter in by touching the three point line creating a 2o3 situation at the other end. Score or stop adds two more players for 3o4 situation, then two more get added for a 5o0. Finally, 1 player is added for 5o5 and the 2 minute clock begins. Teaches disadvantage and teamwork in transition situations. 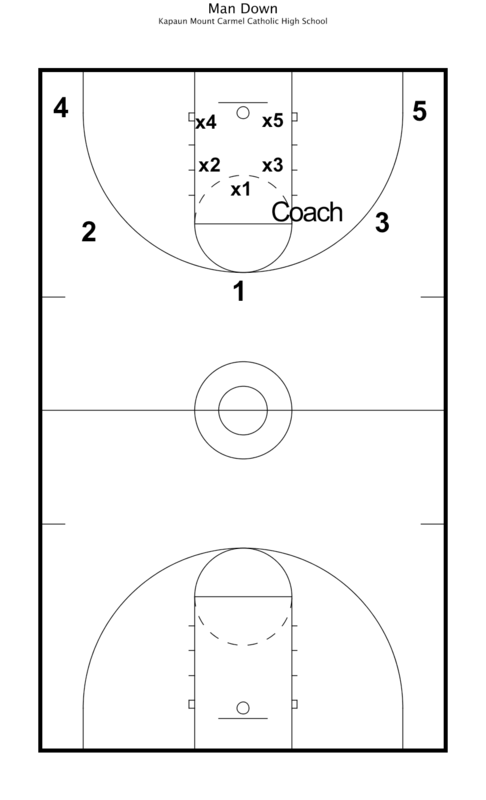 Diagram 13: Shoot free throw. If made or miss defense goes to other end 2o1 with two passes ONLY. Diagram 14: After shot or turnover, 2 offensive players are added for 3o2, this keeps going until it is 5o5 for one possession. Team with most points wins or stops. Players must touch a cone while the game continues going to the other end. Just for a brief moment, the situation is 4o5 until the man down recovers and picks up their original man. Usually we go down, back, and down before the drill ends. 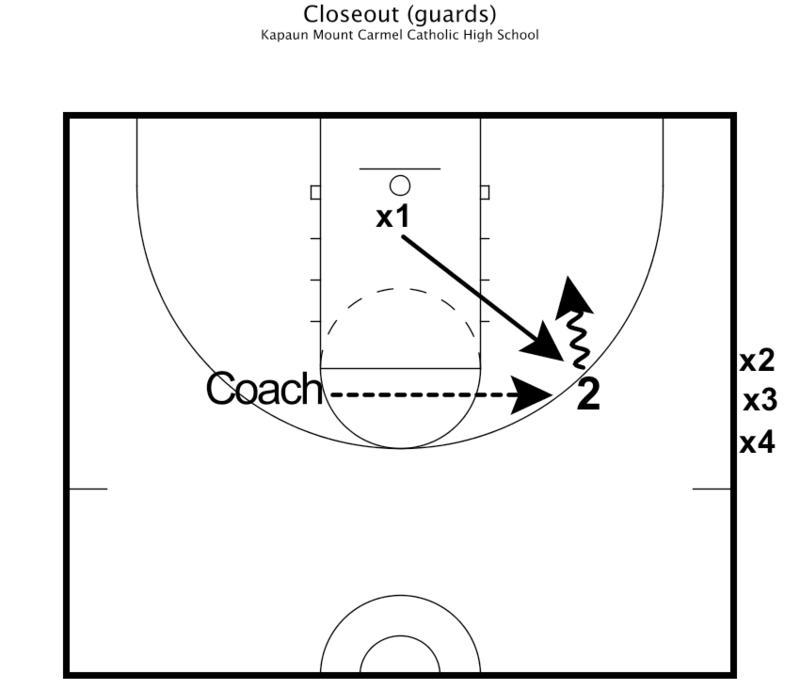 Transition defense takes place during this practice plan drill, along with offensive spacing and movement. 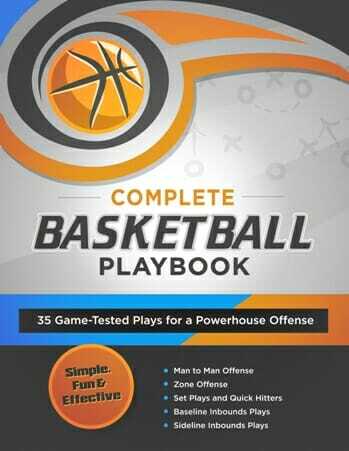 Teaches players to play fast. 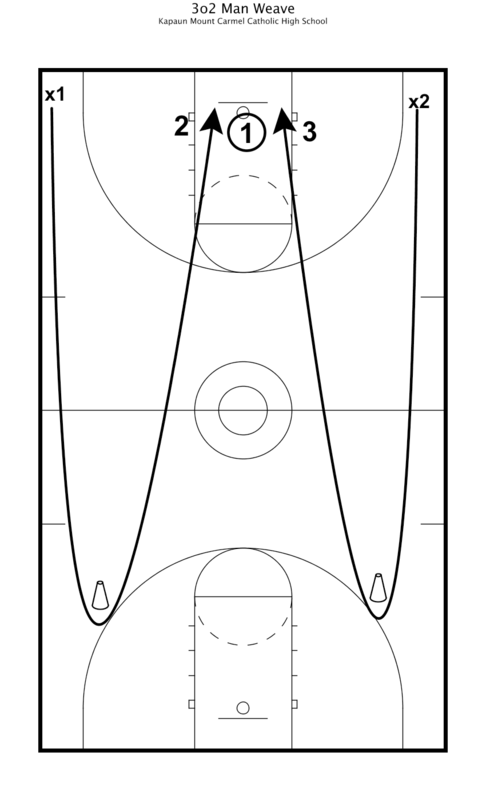 Diagram 15: 3 stops team wins: player who gets ball on defense must run around cone then get back to find open man, closest person to ball JAMS dribbler, next guard rotates to middle back, post rotates to LOW HOLE. Diagonal back is covered by other forward. And don’t forget to Become a Fan on Facebook, where we will be talking about more proven practice plan techniques and tips!